Is this system really just a surface cleaning type method of cleaning? When using our machines, most carpet are done by encapsulating the soil load, not by removing it. This eliminates the need for a lot of pads to be used during the cleaning process, plus fiber are being stripped of and the carpet is actually left cleaner than by any other method or approach. The advent of the Simply Clean High Speed machines made carpet cleaning easier, faster, better and much more economical. By cleaning carpets this way you can get more dirt out than the other methods and have no problem competing and surpassing many of the Hot Water Extraction cleaners you have in your area. When you combine the agitation of the pad plus the absorbency of 100% cotton you have an excellent vehicle for removing soil and stains. Also, the oscillating of the pad by the floor machine causes all sides of the fiber not only to be cleaned but also to be lifted and freed for vacuuming. Many systems over the years have tried using “bonnets”, but unless they are 100% cotton and the pads are driven by an oscillating motion instead of a rotary motion, the customers will not be thrilled like they should be. Can this type of method truly deep clean a carpet like “steam cleaning” can? Our machines actually cause the carpets to need less cleaning, less often. The encapsulation process, encapsulates the soil, but also the fibers, so they do not attract to each other. “Steam Cleaning” does not always deep clean a carpet. We have gone against and behind hundreds of steamers in our career as carpet cleaners and have not as of yet come across many a carpet that could not be improved on. The perception that steam cleaning is always deep cleaning is flawed as well. Often stains and soil are sent to the back of the carpet and when the moisture is vacuumed off the top of the carpet it has a clean appearance, however, often the dirt than wicks back to the surface as the carpet dries or within a few days reappears. Is there of lot of timely stain treatments before cleaning? With our cleaning machines, the agitation is so extensive that very little spotting is required. Although the complete carpet is sprayed, there is not much else to do other than spray it and then clean it. We have found over the years that if Abstraction VLM does not release the stain from the carpet, than there is not much of a chance of it coming out. There are only very few stains that do not come out. Kool-Aid may come out with any one of several different methods. Bleached spots remain and at times pet stains that have burned the carpet will leave a yellowish stain behind. When cleaning olefin berber, what do you do different than other types of carpet? Because olefin does not absorb any moisture make sure the pre-spray is light and do NOT try soaking any bad stains, clean with pads that are wrung out. The less moisture the better the pick up and clean on olefin berbers. With the our machines, we start off with a dry pad and let the spray on the carpet fill it us as you move forward. It is best to squeeze them out, do not wring them out, we advertise an hour dry, this allows us plenty of moisture for a quick deep clean. To dry of pads and you will not clean as deeply nor as quickly. Exceptions are olefins or where there is a lot of old soap in the carpets, there you clean with wrung out pads. How wet should our pads be when Oscillating Pad Extraction cleaning? What is mandatory after Oscillating Pad Extraction cleaning a carpet? Vacuuming the carpet, the nature of OP is to lift the carpet pile, once lifted you will remove more particulates than ever, plus the vacuuming of damp carpet does a great job of grooming the carpet fibers. How can we tell when we are finished cleaning a carpet? With encapsulation and our high speed machines a carpet is clean when it looks clean, the carpet looks great and the pads are gray. What do we do when you have a really bad graphite stain? Vacuum good and then spray lightly as usual. Clean like normal and what doesn’t come out we use a dry pad on. What is imperative when cleaning a soft top nylon residential carpet? With our machines all carpets can be cleaned safely without any fear of distortion or tip blooming. The larger orbit actually helps re-twist the fibers. What carpets look much better after they are totally dry? Olefins and polyesters always look much better dry then when they are just finished being cleaned. As a rule, Oscillating Pad Extraction cleaned or Encapped carpets look much better the next day, while Hot Water Extraction cleaned carpets often look much worse. How do we remove a soap or shampoo spills from the carpet with Oscillating Pad Extraction? Use a sopping wet pad, agitate the soap and let it foam up real good, take our glider and scrape the carpet, putting the soap into the dirty pad bucket. Then we use a dry pad. Now the soap is gone, don’t believe me, we can use use another wet pad and you will have no foam at all. How do we eliminate wickbacks on a heavy beverage spill? We clean normally first, if it is quite heavy then we use a wet pad followed by a couple of dry pads. They will take up the moisture and the remainder of the beverage spill. One of the myths is that VLM stops wickbacks because it is almost dry, the truth is, it stops wickbacks because we get out what is causing it. With our machines and encapsulation process, the dirt is separated from the fibers and vacuumed away. Is carpet really dry in one hour? Because of our very low moisture cleaning method, our dry times are about an hour. 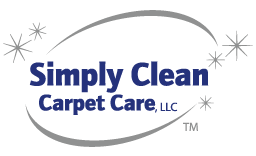 Customer satisfaction and quality restoration has always been the backbone of our carpet cleaning company. Call (859) 321-2070 or request a floor cleaning quote. When it comes to a trustworthy carpet cleaner in Lexington, KY, Simply Clean Carpet Care and its team of highly trained technicians are here to help! For the past 18 years we have served the Lexington community and surrounding counties with carpet cleaning services for homes and businesses.